Leader of Wandsworth Council Ravi Govindia: “ Our scheme would provide an alternative to tortuous journeys on the Piccadilly Line and help get more cars off the road. " 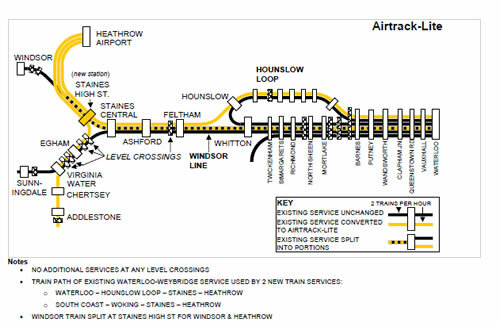 The new version – renamed 'Airtrack Lite' - would provide four trains an hour from Waterloo to Terminal 5. The service would include stops in the borough at Queenstown Road, Clapham Junction, Wandsworth Town and Putney. Last October Wandsworth Council unveiled the rail proposal which is based on BAA’s ‘Airtack’ scheme. The amended plans avoids routing extra trains through level crossings in Mortlake and Egham which was the key problem with the original scheme and led to it being scrapped in April last year. Hounslow and Hammersmith & Fulham Councils are backing the scheme as a key measure to improve surface access to the airport and to ease congestion on the Piccadilly Line. The proposals have now been discussed at top level meetings with the Department for Transport (DfT) and BAA. The scheme has now been included in the tender documents for the Great Western Rail Franchise. The next franchisee will be expected to help develop the proposal further as a means of improving links to Heathrow. Leader of Wandsworth Council Ravi Govindia said: “We’ve made a good start with Airtrack Lite but there is still a lot of work to do behind the scenes building the case. What everyone can agree on is that Heathrow needs to be at centre of a genuine local rail network offering easy access to communities on all sides of the airport. Our scheme would provide an alternative to tortuous journeys on the Piccadilly Line and help get more cars off the road. Two trains an hour would run between Waterloo and Heathrow via the Hounslow loop which includes Chiswick, Kew Bridge and Brentford stations. Two existing services on the Waterloo-Windsor line would split at Staines to provide a further direct link to Terminal Five. Two services an hour would also come up from Weybridge to Heathrow - again without adding extra frequencies over level crossings at Egham. The scheme would require a new station at Staines and a new stretch of track from here to Terminal 5. The rest of the route would run along existing lines. Heathrow is one of Europe's busiest airports but is served only by the Heathrow Express to Paddington and by the Piccadilly Line. This forces Wandsworth residents to travel north through London to join a Heathrow bound service rather than travelling direct.